Horne C, Chew BP, Wiseman BS, Dziuk PJ, Relationship between the level of estrone sulfate in the plasma and the number of fetuses during pregnancy in the gilt. Biol. Reprod., 1983, 29 (1): 56–62. ; Giton F, de la Taille A, Allory Y; et al., Estrone sulfate (E1S), a prognosis marker for tumor aggressiveness in prostate cancer (PCa). J. Steroid Biochem. Mol. Biol., 2008, 109 (1–2): 158–67. 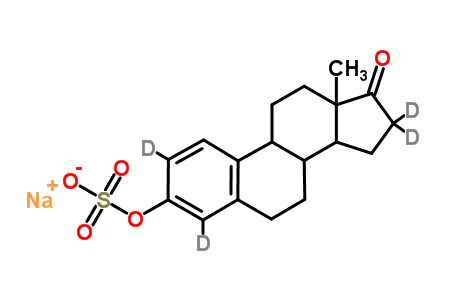 Applications: A labeled sulfated estrone. Found in the conjugated estrogen formulation Premarin. Used as a prognosis indicator for prostate cancer.